COLRAIN - Some people use the spare room in their house for an office or an entertainment center. Eli Rogosa made hers into a wheat museum. Rogosa drinks coffee flavored with her neighbor’s maple syrup as she sautes mushrooms and garlic with curry powder. This is the filling for a rustic knotted bread made from einkorn, an ancient grain related to wheat. Rogosa grew, threshed, and milled the einkorn into flour, and she hopes that others will follow suit. From her home, a former one-room schoolhouse, she runs the Heritage Wheat Conservancy, an organization she started in 2001 to promote nearly forgotten heirloom varieties of wheat such as emmer, khorani, and rouge de Bordeaux. 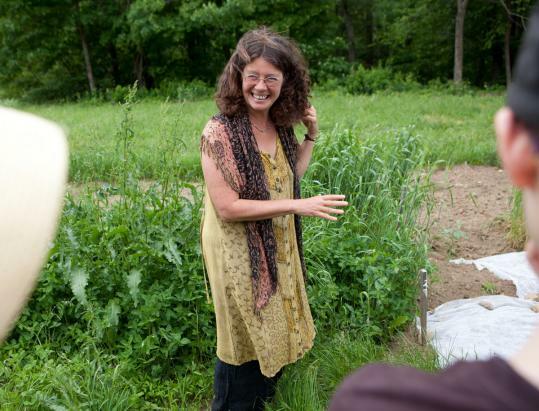 She now grows seeds acquired from gene banks around the world on her own land, Colrain Seed Farm, and at the University of Massachusetts-Amherst, where she is funded by the USDA to select for plants that thrive best in this climate. “I’m looking for fat. Fat seed, fat stalks. Robust. Resilient. Healthy. If anything has a problem, goodbye. Compost.’’ Rogosa, who has wavy auburn hair and a healthy glow, favors flowing skirts and earth tones. She describes the loss of the many different types of heirloom wheat as a “world-wide silent crisis’’ with repercussions for food security. “We don’t realize how much biodiversity has been lost or is on the verge of extinction,’’ she says. Less diversity means a smaller pool of traits, which translates to fewer possibilities for adaptation to a changing climate. The sheaves that hang on her walls look different from those depicted on a package of flour. “It’s just the most beautiful plant in the world,’’ says Rogosa, describing emmer wheat, which has golden stalks and purple heads and grows to a height of 4 or 5 feet. She sows the majestic plants a full foot apart. “They have a very ancient look to them,’’ she says. Older grains such as einkorn and emmer contain less gluten than their contemporary counterparts, making them more easily digestible. The stuffed einkorn bread emerges from the oven. The flour lends a distinctive sweet and nutty taste to the savory curried mushroom filling. This food has been around for a long time, showing up in the stomach of a 5,000-year-old mummy discovered in the Italian Alps. “[Einkorn] has a complexity of flavor that modern wheat does not,’’ says Rogosa. Despite the popularity of wood-fired ovens and artisan baking, breadmakers are still using what she considers an inferior product. “Modern wheat to me tastes like cardboard.’’ She believes that, like wine, grain can express the terroir of a region, and claims to taste differences in flavor from year to year. Rogosa bakes bread for the Green Fields Market in nearby Greenfield using an enormous copper-clad oven she designed with a local builder and mounted on a trailer for portability. Before she purchased a foot-powered threshing machine, she relied on a combination of floor mats from her car and neighborhood children, who would stand on the mats and do the twist to separate the wheat from the chaff. She sells both flour and seeds on her website and brings the oven to workshops and festivals.